Heh. Am I ready for a new year or what? 2001, the year we all longed for as geeky teenagers back at Lane Tech High in the late 1960s, has come and gone, and leaves us bruised and poorer and happily handing our civil liberties to various governments in the cause of controlling terrorismgovernments whose main concern is keeping the general public in line and in the service of nanny-state lefties and big corporations. That's an interesting confluence seen more and more in recent years: Big Corporations have gone left, and now worship at the same altar as Big Government. Both want things their way, and neither have any particular respect for anyone who believes something other than the house cant. So while the anti-globalism crackpots profess to hate big corporations, they're indistinguishable from the corporations they profess to hate, when you look beneath the specifics of what they claim to be for, and instead see what their underlying ideologies are: Anti-freedom, anti-choice, anti-public. Totalitarianism comes in many flavors, but the scum at the bottom of the bowl tastes exactly the same. Losers of the year: The dial-up majorityanalog modem users who continue to be teased by DSL and cable Internet-access ads that mask limited availability or delivery nightmares, while the industry's talking heads take broadband for granted. Ha! If that doesn't sum up my own feelings, nothing does. It was a lackluster year on the hardware scene in terms of innovation, but prices definitely fell. I filled out my Dell with as much RAM as it could hold, and picked up a remarkable Epson photo printer for cheap. (Excellent once I figured out how to use it, no help from the execrable Engrish documentation.) I got a superb little IBM laptop, and a really good scanner. Few hardware challenges loom for me in the coming year, other than figuring out what to do about removable media. I am outgrowing 100MB Zip cartridges, but I'm leery of moving to Zip 250s. Ah, well. I'll leave that challenge for the New Year. In the meantime...damn, there's still 12 hours and thirty six minutes left of 2001. Hurry, midnight! It doesn't have a powerful political lobby behind it, but diabetes kills way more people than AIDS every year and its incidence is exploding worldwide. Obesity may well be the greatest single cause, which is served by idiotic medical ideology that demands that we eliminate fat from our diet at all costs while giving carbohydrates a pass, or even an endorsement. (The damfool "food pyramid" implies that the healthiest diet is one consisting almost entirely of grains, which is insane.) I am ever more convinced that the real cause of obesity is carbohydrates (coupled with lack of exercise) but hell will freeze over before the medical establishment will admit that it's been horribly wrong all these years. It's quite clear, however, that I lost the 15 pounds I lost only after I eliminated sugar, pasta, and refined grains (including rice) from my diet. My cholesterol has gone down, even though the proportion of fat in my diet (relative to everything else) has gone up. And I feel better! But that's not my point today. Almost unremarked in medical discussion today is the proven truth that diabetes is aggratived by stress, and in fact we're coming around to the realization that stress can actually cause diabetes in the obese or those with a genetic predisposition to it. I am struck by the fact that we have a historically unique confluence of abundance and stress in the First World today, and I'm pretty sure that this volatile combination of overweight people in high-pressure jobs and self-imposed stressful family situations is behind a great deal of the explosion of type-2 (adult onset) diabetes. So in addition to walking and not eating so much spaghetti, you can help fend off diabetes by simplifying your life, not overextending yourself in pursuit of wealth or accomplishment, not stressing yourself in service to your kids (three sports plus two musical instruments each times three kids could equal early death in parents, or perhaps just the desire for it) and taking up meditation. If I find more research on this topic on the Web, I'll link to it here. Little by (very) little, we seem to be making progress toward Power Line Connectivity (PLC) which is nothing more than broadband Net access through your power lines. The technology is conceptually similar to DSL, which imposes a data-modulated radio-frequency signal atop your audio-frequency phone connection. PLC imposes a data-modulated radio-frequency signal atop your 60 Hz power connection. In the most seamless vision of how this would work, your computer would network right through its existing power cord. No more tacking coaxial cable or RJ45 cable around the houseand one less wire in the ratsnest behind your machine. Europe is ahead of us here. There are local technical challenges, chief of which is the "low" voltage we use in the US for power distribution. In Europe they use 220V mains, which are more dangerous from a shock standpoint, but much more efficient in other ways, like ohmic losses and wire size. (The higher the voltage, the lower the current required to transfer the same level of power.) Chief advantage of higher line voltages for PLC is that power runs go much farther between passes through transformers, which (for current technology, at least) block the PLC RF data signal. In the US you're rarely more than a mile or so from a transformer, whereas in Europe that distance could be five or ten miles. Still, PLC is a very attractive solution for the "last mile problem" (basically, getting broadband from a data node into nearby homes) and don't bet that we won't solve the transformer block, either. I know enough electronics to imagine a sort of RF bypass connection around power transformers that is opaque to AC power. (Hint: It's called a "capacitor.") If the rest of the system can be perfected, the transformers will not be a stumbling block. Note well that we already have powerline-based networking for inside the home. PLC just extends the same basic idea to broadband connection to the Internet. X10 is an ancient and simple realization of the idea, and there were "wireless intercoms" that imposed a simple analog-modulated RF audio signal on the home power line forty years ago. So some of the engineering has already been done, and the rest is, for the most part, creating the system on the "server" (power provider) side. The reason I am most bullish about PLC might seem odd, but think for a second: In PLC, the data service does not in any way compete with the underlying service. Telcos are conflicted about getting behind DSL because DSL can carry phone traffic, just as the underlying copper can. Cable operators are conflicted about cable modem service because cable modem service can carry streaming video and other high-bandwidth content. However, PLC can't deliver powerso there's no possible competition. A power company could open wide the broadband doors through its wiring, and host competing carriers while collecting an access fee from each. If I were in the power business, I'd be drooling on the floor. We're still three or four years off, but my prediction is quite firm: It will happen. A chap who is just a few years older than I posted a big and fairly detailed site about media SF in the 1950s: Tom Corbett, Space Cadet, Space Patrol, and their kin. I was born in 1952, so by the time I was big enough to control my TV habits, a lot of the stuff he describes was history, or with some luck, in sparse reruns. (I barely remember having a Captain Midnight hot chocolate mug, which my mother later used to scoop detergent powder out of the box in the basement.) But what I direct your attention to more closely are the author's comments on the 1950s themselves. He clearly loves them, and indicates that "...the 1950s were the ideal time to be a child." True enough, and his remarks on the advantages to growing up in the Fifties are worth reading, and lamenting of their passing. The Fifties were a pretty hideous time to be an adult, howeversomething the author, having been a child then, may not have sufficiently meditated upon. The psychosexual pathology of the 1950s is little remarked these days, and it took the "sexual revolution" (a phrase I hate) of the 1960s to break its power over the American people. And while I don't endorse promiscuity, I think the hysteria and paranoia of the 1950s (which had a distinctively sexual flavor, if you look at the popular culture of the time, particularly horror comics) are by far the greater evil, and we are well rid of them. It occurred to me this morning that nowhere that I have found in Lord of the Rings does it anywhere say that elves have pointed ears. Why, then, are elves almost universally depicted with pointed ears? Who originated this convention? Would JRRT have approved? And what are we to make of the fact that in the current film Elrond reminds me powerfully of Mr. Spock? To cram the whole book into three hours, some material had to be trimmed. Tom Bombadil, the Barrow Wights, the stop in Buckland, the visit with Farmer Maggot, and lots of other early local color was removed, and really was not a great loss. (My long-held view is that Tom Bombadil doesn't belong in the Middle Earth cycle to begin with; see my entry for December 11.) There is a nicely done summary at the beginning of where the Rings of Power came from, which will be helpful for the 17 people in America who have never read it. But it really and truly does follow the book very closely, right down to certain key passages of dialog. Again, my quibbles with the visual presentation were few. There is a sort of "sacred tradition" in the Tolkien subculture, typefied by the art of the Brothers Hildebrandt, and the film is very faithful to that sacred tradition. Orthanc and Isengard looked precisely as I imagined them, and Rivendell went far beyond my expectations. My single most significant yeahbut is the presentation of Lorien. Far from being a sort of golden paradise, it is portrayed as rather dark and gray and ominous, and reminds me a little of the Ewok forest in Star Wars: The Return of the Jedi. Galadriel fell short for me as well, though it's much harder to describe why. Maybe she needed pointier earsor a little more empathy. Aragorn will do, but in truth, actor Viggo Mortensen is a little too pretty for my tastes. I had always imagined someone powerfully muscled, craggy and somewhat weatherbeaten; after all, Aragorn is 90 or so years old when the story takes place, and by then he'd been a Ranger wandering the wild country considerably longer than I've been alive. (Noble Numenoreans live much longer than lesser Men.) I wasn't crazy about Arwen taking Glorfindel's role, but I understand why it was done. The special effects? Magnificent. The pits of Isengard, the Ringwraiths, the thin glimpse we get of Barad Dur, the shadow world that Frodo experiences when wearing the Ring, and cripes, the Balrog!expense was not spared, and the world the film creates is utterly real. The outdoor scenes were filmed in New Zealand, which is every bit as beautiful as you might hope. So hey, go see it. I saw it with my nephews while Carol was shopping with her sister, and later this week I'm going to see it again with Carol. Like certain other seminal SF and fantasy films, it will support multiple viewings. This time, at least, you can't loseeven if Gandalf's nose is too big. Unlike last year (when I was recovering from hernia surgery) we flew to Chicago and spent Christmas with our families. I miss them, and treasure the time I can spend with them, especially since we have lost so many of the older generation in recent years. The delight we find in spending time with family at Christmas is key. One of the distinctives of Christianity that often gets lost in this day of radically individualized "spirituality" is that Christianity is celebrated in community, not alone. Edward Clark, in his fine little book Five Great Catholic Ideas, emphasizes that we are saved in community. Hell may be nothing more than an inability to relate to othersa hell that many people experience right here on Earth. Most of what Catholicism teaches cooks down to relatednessto God, to others, to the communitywhen you strip away the ghastly legalistic excesses that have accumulated in the Western culture of Christianity since the time of Augustine of Hippo. The message of Christ is to look beyond ourselves, and what He saved us from is the fundamental human tendency to put our own needs ahead of all others. So I hope you did what we did this Christmas, and spent time with family and friends. I also hope that in doing so, you stepped outside yourself a little, and made yourself more fully available to themlistening to them, encouraging them, reassuring them that they are loved and that they are not alone. If we can do that on a consistent basis, not just once a year, Hell can have no hold on us. All the best and the blessed this Christmas season, from Carol and me. Remember what Christ taught us: Love, and you will be loved. What goes around comes around. We are saved in community, so seek community, and ultimately, all manner of thing will be well. There is a fine old Polish Christmas custom that has been seen spreading far beyond Roman Catholic parishes with heavy Polish ethnic presence. It involves oplatki (pronounced oh-pwaht-key) which is the plural form of oplatek, which is a thin rectangular wafer (about the size of an index card) made of the same brittle unleavened wheat dough as Catholic communion wafers are. The oplatki wafers are blessed at the local parish church, and distributed during the week before Christmas. If you don't have access to a Roman Catholic parish, you can order oplatki from (I kid you not) www.oplatki.com. On Christmas eve, Polish custom is to hold "vigil supper" (vigilia; pronounced vee-lee-hyah) as soon as the first star can be seen in the sky; usually between 4:30 and 5:00 PM. As Christmas presents are in some families (including my own, as a child) opened immediately after vigilia, I was very good at spotting the first star. (No fair spotting planets!) When everyone sits down to supper, and generally after an initial toast with wine (that was my first encounter with wine, albeit Mogen David Concord Grape) the oplatek wafer is taken out and given first to the head of the household, who divides it up into equal portions so that every person at the table has a piece. The head of the household then offers the oplatek to the person beside him or her at the table, and that person breaks off a small piece. Then the offerer makes a wish for that person, or a blessing, as is the custom in that family. Then the person who took the fragment of oplatek eats it. The offerer then offers the oplatek to the next person around the table, and so on until everyone has partaken. 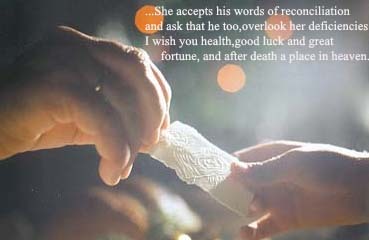 Then the next person offers a wish or a blessing to the person beside him or her, and goes around the table similarly, until everyone has offered everyone a wish and a piece of oplatek. For small families like ours it takes only a few minutes, but in large families it sometimes takes half an hour and multiple oplatki, but the sense of love and caring for all present is very moving, and it allows the meal itself to begin with a glow that otherwise might not be there. Why not try it? You don't have to be Catholic, or even religious. All you have to have is the desire to make explicit the bonds that exist between everyone and everyone else in a family or group of friends. It helps push Christmas a little closer to what it should be about: Not receiving, or even giving, but just being, in the sense of loving community that arises among family and friends. A team of researchers from IBM and Stanford University have successfully created a simple quantum computer that has now performed the first quantum calculation, as described in an article on MSNBC. The quantum machine they put together successfully factored the number 15 into its factors 5 and 3. This may not seem like much, but in fact it's a breakthrough in basic science. Many people (myself included) had doubts that quantum computing could ever actually be implemented in useful form. It's true that the IBM/Stanford mechanism won't scale to a useful size. But the successful implementation of Shor's Algorithm proves that it can be done. The rest, as they say, is engineering. So what does this mean? Theoretically, a mature quantum computer could factor very large numbers almost instantaneously. Factoring large numbers is a pathologically difficult thing for computers to do, and its difficulty is one of the things that goes into certain kinds of cryptographic algorithms, including most current public key algorithms like the seminal RSA. A quantum computer could thus break most crypto systems that depend for their security on the difficulty of factoring very large numbers. This isn't the end of the crypto world, of course. There are lots of ways to scramble a cat, and we'll just have to go out and get us some new ones. The coolest thing about quantum computing is that I am at a total loss to guess what else it will change. I'm just wedgedand that doesn't happen too very often. The universe is certainly stranger than I can imagine, and that's a good part of what makes modern life so much fun. The recession has begun sorting our species by Internet addiction with a vengeance: People who were once clamouring for broadband are now closing accounts by the tens of thousands as soon as money gets tight. Dialup costs have come down a lot in the past ten years; my nephews pay less than $10 a month for their 56K dialup. Broadband, by contrast, is typically $40-$60 per month, which adds up quickly when a reliable paycheck isn't part of the equation. So when things get tight, what do you dump? As it turns out, broadband is almost always first for the vast majority of Americans, followed by health clubs, followed by cable TV. (I don't remember where I read this, alas, or I'd link to the piece.) Of course, there are others who would give up wearing clothes before they'd give up their broadband connection, but we know who we are, heh. My concern here is that broadband is still in a vulnerable position as a tech industry. Too much disruption and account abandonment could slow its percolation out into the hinterlands. We need it, and need it badly, for things we don't even know about yet. Bandwidth is a fundamental mechanism. It's one of those concepts that change the shape of things, not just their magnitude. In a much-linked article in Wired, we get a report that autism is exploding in high-tech employment centers like Silicon Valley and Rochester, NY (where I lived for six years) and the implication is intriguing: Male and female techies are marrying, and a previously unknown recessive is beginning to express. The article is worth reading, but the condition in question (which has been called Asperger's Syndrome) is a much milder form of autism than the Rain Man kind: The affected children are very bright, highly focused, asocial, and technically inclinedjust like their parents, only much moreso. They have a lot of trouble reading the social cues of others, dislike eye contact, and generally have difficulty finding a place in society's human matrix. The article suggests a genetic recessive, and that explanation appeals to me. For the first time in history women have been allowed a place in the technical world, and those who have chosen technical careers more often than not choose mates much like themselves. In older times, "odd" women (which would include any female with a technical bent) would tend not to marry at all, or would marry well beneath their intellectual level, to men who were unlikely to carry the recessive. It was interesting, however, to read some of the comments on the Plastic aggregator, which suggested a different source for the syndrome: Toxic waste in the environment of the affected areas. It's very true that Silicon Valley and the Rochester NY area (home of Xerox and Kodak and much other chemical/technical industry) have a lot of ancient pollution in the soil. It's certainly possible, and some really good epidemilogical research should be done to see which is actually the case. I have to grin, though, to see the old liberal/conservative split surface once more: The conservatives blame genetics, and the liberals blame the environment. Will we be allowed to determine which it is? Or will political orthodoxy stand in the way of even asking the question? Cell phones do cause accidents. The adult son of some friends of ours was driving down a local artery recently when his cell phone went off. He scrambled to grab it, and in doing so lost control of his car, which went over a curb before he got it back under his control. Two tires and two rims had to be replaced, along with other odd repairs totaling almost $2000. It was very late at night and the roads were empty, or he might well have hit somebody. I used to assume that anybody driving oddly was drunk or stoned. These days, when I see somebody driving oddly, they've almost invariably got a phone glued to their ear. I had thought some of the hysteria against cell phones in cars was overdone, but as time goes on I'm drifting more and more toward that side. We're back. The cruise was a little chilly; we went down the west coast of Mexico as far as Puerta Vallarta, but in seven days had only one day of full sun. So we stayed on the cruise boat quite a bit, ate perhaps a little too much, but still had a wonderful time. And we saw a whale! I didn't have my camera in my hand at that moment (we were taking a cruise tour on a 40-foot catamaran outside of Cabo San Lucas and I was hanging onto a stanchion for dear life) but we were no more than 20-25 feet from the whale when it turned tail-up and dove. And that was some tail! Perhaps more interesting than the cruise itself was our first experience in flying since the Attack. It all seemed oddly normal: We encountered no delays in getting through security or ticketing, though it's true we obeyed the slightly gonzo dictum to be at the airport two hours prior too departure. Had we gotten there later it might have been tighter. The planes were mostly full, not mostly empty. We experienced no ridiculous excesses in security, and I saw that nail clippers and tweezers are no longer no-nos. My laptop was X-rayed but nobody demanded that I turn it on to prove it wasn't a fake. So sanity seems to be returning in bits and pieces, as the war against terrorism seeks a balance between hysteria and complacency. So far, so good. I've always rolled my eyes at those on the left who have been warning of the growing divide between the "computing haves" (those who have home computers) and the "computer have-nots" who do not. Perfectly functional used PCs are almost free these days, so I think it's pretty much the case that anybody who really wants a computer can have one. So the "personal computing gap" is entirely a matter of personal choiceand I know a few people who have chosen not to partake. Shucks, they seem to live pretty fulfilled lives, too. Broadband is not yet essential to an intellectual life in the same ways that a PC is, but it's leaning in that direction. The politics of broadband deployment are many and tangled, but I'm convinced that the barriers are political, and mostly involve entrenched interests in the telecomm industry. Yes, there are economic issues in rural America (due to what I call the "last twenty miles problem") but out in the exurbs, it's mainly politics, and could be solved by holding a few telco feet to the fire. Solving the rural broadband problem, on the other hand, may require some cost-shifting from urban to rural areas, as was done with electrification and telephone connections many years ago. Ironically, this slightly socialist ploy is sharply opposed by the urban left, even though those who will most benefit are the rural poor, who you would think the urban left would be concerned about. Heh-heh, not until they join the Democratic Party. As I've been reading The Lord of the Rings again, I've pulled down from my shelves two useful references for keeping the multitude of names and places and things straight in my head: J. E. A. Tyler's The Tolkien Companion (1976) and Karen Wynn Fonstad's The Atlas of Middle Earth (1981). My copies are thus pretty old, but both books are still in print, and judging from the comments on Amazon, Tyler's has been revised pretty extensively over the years, to remove some of his guesses and speculations as Christopher Tolkien has released more and more of his father's papers and notebooks to the public. Tyler's book is an encyclopedic reference of names, places, and things, with short descriptions of each. 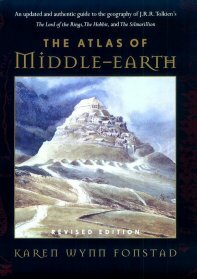 The Atlas of Middle Earth is just that: Maps of locations in Tolkien's universe (including Numenor and even Valinor) keyed to events in the greater saga, including The Silmarillion. 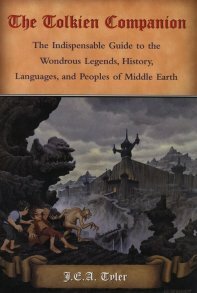 Although reviewers on Amazon have quibbles with both books (largely from purists, it appears to me) they've been extremely useful, especially once you get into The Two Towers and the plot lines become splintered and complex, with different factions of the Fellowship going different places and getting involved in different things. (I have always found the arcane politics of the Gondor kingdom extremely hard to keep straight in my head.) Both highly recommended. The weather has been pretty marginal for cruising (cold and cloudy, even in tropical Mazatlan) so we stayed on board ship today and saw Osmosis Jones. It's a perfect example of a film with a brilliant concept that was mostly ruined by lifeless scripting. The idea has great promise: Bill Murray, in the live-action portion, plays Frank, a slovenly widower with an idealistic young daughter. Frank's body is shown in cartoon animation as the City of Frank, complete with a Mayor (voiced by William Shatner) a police chief, mobsters (assorted germs) and all the other upright and downright citizens of a big city. Osmosis Jones (voiced by Chris Rock) is a young white blood cell (inexplicably drawn in blue, as shown here) on the police force, not quite a rookie but audacious, snotty, and, well, a little careless. Jones routinely patrols the Mouth, where one day a peculiar germ appears. This is not any ordinary germ, but Thrax, a.k.a. Muerta Roja (Red Death) who intends to take Frank out entirelykill him, and do it in record time. Jones figures this out after awhile, but nobody believes him. 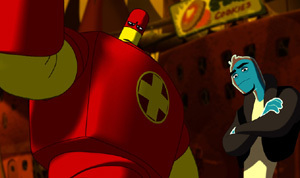 Instead, for a partner he is saddled with the large and powerful but mostly clueless Drix, a cold pill, voiced brilliantly by David Hyde Pierce. The two of them tool around the Superior Vena Cava (a freeway) in Jones' lopsided patrol car, searching for Thrax and having reparteé. Jones tries gamely to teach Drix how to be cool and fit in with the lowlife that they're trying to quiz about Thrax, and that's probably the best part of the film. (While laying about him in a bar fightinside Frank's enormous forehead pimpleDrix is shooting germs while shouting in a perfect Niles Crane voice: "Yo mama! Yo mama! Yoyo Ma!") Most of the rest of it is paceless and boring, even with good animation. Great lines are few, chuckles thin and far between. Far too much of the film's humor cooks down to fart and barf jokes. I don't like elves as cultural icons, probably for much the same reason that I don't like angels, which elves strongly resemble. Elves and angels are a little too trendy, and have become coated with the sort of banality that popular culture bestows on things that are too much in the common mind. Reading The Fellowship of the Ring again this week reminded me that there is some mythic gold hidden in the concept of elves, and Tolkien mined that vein deeper and better than anyone else I've ever read. Tolkien's elves are depicted as Eru's first intelligent creatures to walk Middle Earth. They are embodied Valar, who in turn were something like angels, bodiless spirits sharing a timeless realm with Eru. After creating the Earth, Eru mixed his metaphors a little too much, and placed imperishable intelligence within a perishable creation. Although undying, the elves are sad, because through the passing ages they watch Middle Earth gradually spin down toward its inevitable end. After creating the elves, Eru thought the better of it and came up with Version 2.0: Men (humans) who are much better adapted to Middle Earth, entropy, and the remorseless passage of time. Men echo their world, and grow old and die just as the world grows older, eventually to die. Tolkien hints that Eru has reserved an eternal destiny to Men that does not involve Middle Earth, a timeless sort of immortality that the Elves have, but divorced from a universe mired in Time. This thing Death, originally called the Gift of Men, is corrupted by the evil beings Sauron and Morgoth, but the elves recognize it for what it is, and you get the impression in some passages that they envy Men their mortal boundedness. This is a powerful concept: That elves are the victims of a little too much Divine generosity. They should have remained angels, a life for which they seem better suited. And it made me wonder again something I have wondered independently of Tolkien's work: Can human beings partake of immortality and still remain human? Certainly conquering physical death here on Earth via technology has its risks and its downside, if you think about it more than a minute or two. But even positing an eternal life after death�what does it mean to exist either in time unending, or in some ineffable moment outside of time? Our thoughts and our sense of self are organized by time: We learn and we grow via experience. Intriguingly, Tolkien's elves seem not to learn or change much, sometimes across many thousands of years. To be human, by contrast, is to change, but to change means to live within time, with all that that implies. As much as I believe in a life after death, I wonder sometimes if there's any honest way that Jeff the Immortal Spirit could be considered the same being as Jeff the Evolving Human. Sooner or later I'll know. In anticipation of the release of the film The Fellowship of the Ring later this month, I've begun reading Tolkien's trilogy again, for the first time since I was down for a month with pneumonia in 1992. This will be the sixth time I've read it through, if my memory serves (and it generally does) but with a difference: I am consciously reading it for nuance and detail that are not integral to the relentless march of the grand plot. I know the last time I read it, I was drugged and weary, and it went very quickly because I was skimming many of the slower passages. And prior to that, I don't think I'd read it since 1985, so in truth it's been a lot of years since I've read it carefully. It's delightful, as it was the first time I read it at age 15. And now that I'm older and better read, the nuance jumps off the page at me. I'd never noticed, for example, that Tom Bombadil always speaks in cadence, and not just when he's singing. If you "step back" a little from the meaning of his words, you'll see that it's a kind of continuous poetry. I'd forgotten utterly the meeting of Frodo and his friends with Gildor and other elves in the wooded south of the Shire. (I have never been big on elves. Not sure why.) And somehow, the creepiness of Frodo's encounter with the Barrow Wight had not sunk into memory. In my hurry to get on to the grander parts of the story (like the sequence in Moria, always one of my favorites) I had glossed over a wealth of small detail. But that orc-sword cuts two ways: I'm also noticing minor discontents with certain elements of the story. Most significantly, again, is Tom Bombadil: I just can't escape the conviction that he doesn't belong in the universe of Middle Earth. I know where Tolkien (who was a scholar of mythology and language) got him; he is a conflation of the Green Man of Celtic myth, and the Lord half of the Lord and Lady team of ancient Druidic worship, now revived in modern Paganism. Goldberry is just as certainly the Lady, even though I've heard others claim that the top Valarim, Manwe and Elbereth, are the Lord and Lady. Not so; the Lord and Lady are not as cosmic as that. They are deities close to the Earth, the land, and living things. And that's the impression given by Tom, that he is older than every living thing, and dates back to when Middle Earth was created by Eru, the OneTolkien's name for God within his imaginal cosmology. Interestingly, Tom claims not to be master of the weather, but only of living (and formerly living) creatures. Although vastly powerful, his power is hard to define: He is immune to the power of the Ring, and master of the evil Barrow Wights (ghosts who serve Sauron) which is powerful indeed�and perhaps too powerful for the story. One gets the impression he could drain the One Ring of its malevolent power if he so chose, or at least hide it perpetually from Sauron. Instead, he runs around singing songs, gathering lilies for Goldberry, and being kind of pointless for something as old and powerful as that. He keeps a self-imposed exile within what might be a couple hundred square miles of forest and hill country in an entire world of which he is nominally master�doesn't he care about the stuff that grows in Far Harad, or Rhun? This doesn't mean his chapter isn't masterfully done, as is all of the Trilogy. But it seems, somehow, to belong in another cycle, or perhaps in an account of much more ancient times in the First Age, when a deity like Tom Bombadil would be much more at home, tending Eru's very young creation until it was mature enough to get along on its own. I've heard that Tom was omitted from the film, which I think is a good thing. He doesn't really move the plot along much (except to act as a Deus Ex Flora in getting the Hobbits out of various kinds of trouble) and certainly is a problematic presence in a universe as thoroughly and consistently worked out as that of The Lord of the Rings. Carol and I have embarked on a week-long cruise aboard Royal Caribbean's Vision of the Seas. (Ironically, on the other side of the continent from the Caribbean...we're cruising down the west coast of Mexico and visiting cities that collectively comprise the "Mexican Riviera.") The ship has a new (at this writing, two week old) system that they use to keep track of passengers embarking and disembarking at its various ports of call. When we leave the ship, we swipe our little mag-strip ID cards on a terminal to indicate that we're gone. When we return, we swipe them again, and the terminal brings up a digital photo that the crew identifies us by, so people don't steal the cards and sneak onto the ship. I suspect that systems like this (which really aren't rocket science) will become ubiquitous if we ever actually create a national ID card system. Plan on swiping your card in a turnstile at sports arenas, turnstiles that snap a digital photo of your face so authorities know who's in the stands. Plan on swiping your card to get in to schools and exam rooms, so people can't hire others to take exams for them. Privacy advocates will yelp, but in truth, I doubt most people really care, and I think such systems will withstand all legal challenge. There will be benefitsI think that "identity theft" is a temporary glitch of the current day that such a card will eliminateand all the real downside is not in the card itself so much in what we allow authorities to do with it. If we restore something like genuine rule of law (which suffers at the hands of judicial activism and unrestricted lobbying and tort action) most of the risks that I can foresee go away. Carol and I are today leaving on a cruise to celebrate our 25th wedding anniversary, so I'm going to be quiet for a few days, but before hushing up I wanted to point you all at an intriguing piece of research polling Americans' religious beliefs and habits before and after the Attack. It's good reading in the aggregate, but one point stood out for me: Regular church attendance of atheists (self-described) tripled from 3% to 10% after 9/11. I guess they swear there ain't no heavenbut they pray there ain't no hell. Don't give up on me. I'll be back here in a a week or so. Years ago, I would periodically get paper letters at work (addressed to "Executive" or "CEO") from Nigeria, handwritten or typed on what was clearly a typewriter, begging my help in getting some funds out of Nigeria before some baddie could lay hands on it and seize it. All I had to do was contact someone at a phone number in Nigeria and provide electronic funds transfer information to a bank account I had, so that the money could be moved into it. I would get to keep some part of it (always in the several millions) and would give the rest to the writer once he or she left the country. I knew it was a scam, though sometimes the letters had pretty Nigerian stamps on them. I don't get those letters anymore, but have for several years gotten the same pitch via email. Again, always from Nigeria. The writing is good; it sounds like something a deperate Nigerian might write, though as one of my friends said, it's easy to sound desperate when you live in Nigeria these days. All I can figure is that every so often, some klutz here stateside is stupid enough to set up a funds transfer to an account with some money already in itthough not for long, heh. Otherwise why would they go to all the trouble? The only other question I have is, Why Nigeria? I have never gotten a single pitch from anywhere else. Crazy world. Dean Kamen seems to have developed a marvelous knack for saying the wrong thing. His big pitch for his Segway scooter (as reported in a Salon article) is not that it will help air pollution or reduce parking problems or anything like that, but rather that it will make walkingwhich he considers a total nuisance and waste of timeunnecessary. This from the man who invented the heart stentor is it a species of cross-product marketing? (Use more of this one, need more of that one...) Walking is the very best part of living in a small town or an urban area where things are close enough to walk to. Walking has benefited me personally, in keeping my blood pressure down, in losing me 15 pounds, and in helping me regain cardiovascular endurance I thought I had lost forever. And this is what Segway is supposed to eliminate? Bizarre, bizarre. While talking to my cousin Rose last night, we recalled times in the Fifties when our family was over at their house in Calumet Park, visiting. My cousins and I would eat at the "kids' table," on these weird old iridescent orange glass plates and bowls, while the adults would eat in the dining room on brand new Melmac plastic tableware. My Aunt Josephine had picked up the glass dishes and bowls as freebies at the movie theater as a teenager during the Depression and considered them an emblem of poverty. Once my cousins got older and were no longer exiled to the kids' table, she threw out all the ugly old glassware and everybody graduated to Melmac. Of course, back then we kids were eating on what is now known as "depression glass," which brings a king's ransom on eBay. It's still pretty ugly, though. The lesson here? I'm not sure there is a lesson, apart from, "Never throw out anything ugly." Of course, not all ugly stuff is created equal, and you'll have to wait fifty years to find out if you've chosen the correct ugly stuff. Better idea: Buy Treasury Bills. I bought a "travel keyboard" this week for my IBM X21 subnotebook, and have just spent a little time with it. It's the IBM Media Access Pro, and for $40 is a decent deal. I bought it for those times when I travel but have to do a fair amount of writing. The X21's keyboard is about as good as a subnotebook keyboard can be, given limitations of physical size, but it's no damned good for my brand of speed typing. The Media Access Pro is quite thin and light (so it will pack well, rolled up in my underwear) and yet has a very nice feel to it. (The photo above shows it with the detachable wrist support on the front edge, which makes the keyboard look much bigger than it actually is.) 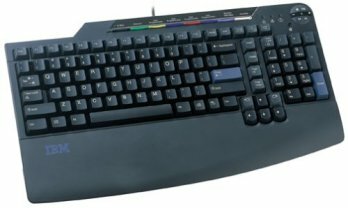 I can do my eight-fingered 100 WPM proprietary keyboarding technique on it without cramping or making too many mistakes, and that's its primary virtue. There's a secondary virtue that clinched the deal, however: It's a USB deviceand it contains a built-in 2-port USB hub. The X21 has 2 USB ports built in, and heretofore I've used one for my Targus compact USB mouse, and the other for a USB ZIP drive. That forces me to choose between having my ZIP drive or my CD-ROM drive installed. Can't do both. The USB hub on the back of the keyboard opens up 2 ports for the one used by the keyboard itself, so I can now have the keyboard plus three other USB devices installed at once: the mouse, the ZIP, and the CD-ROM. There are some other interesting and modestly useful features: Configurable hotkeys for launching programs or going to Web sites, an audio muting button, and a "rocker" volume control. Overall, it's wonderful. You can find it at a lot of office supply places (I bought mine at the local Staples) and it's sold on Amazon. Around $40. Powerfully recommended. Dean Kamen & company demonstrated his Segway self-balancing electric scooter (neé Ginger; see yesterday's entry) in New York's Central Park yesterday, and the world is abuzz. I found ZDNet's article about averagebut was fascinated for a change by the reader comments. I don't ordinarily scroll down to the comments, but sometimes ordinary people have a way of putting their finger on things that media freaks miss. This is one such time. Most of the objections anyone might have to the concept are there in the comments. The two primary ones are cost and legal liability. (The most common objection, exposure to weather, applies equally to all uncovered transport.) I hadn't thought much about legal liability, but it may be an issue; an object with a total mass of 250 pounds on the low end (65 pounds for Segway plus 185 pounds for your typical nonobese male American) moving at 12 MPH can do a lot of damage to pedestrians or other Segway travelers. Cost is a true issue, but I think the $3000 price tag is cream-skimming to recoup some of the R&D & tooling costs. If it's going to survive it will have to come down to $1500 or so, and probably lower. I think it's telling that Segways will first be sold in fleets to industrial customers who have huge shop floors to traverse. If it's just a body that needs to move, or a body and a few papers or other small objects, a Segway with baskets might be just the thing, and is certainly smaller than any golf cart. Golf cart. Golf cart! Egad! That's the market! Segway will cater to the Sun City market more than any other. And by that I mean the market for mild-climate retirement developments, like the famous Sun City here in Arizona. In Sun City and developments like it, access to privately owned streets is controlled (often by guards at gates; yukkh) and golf cart transport is legal and encouraged, for its quiet and cleanliness. The hatefully fascist but hugely successful Terravita development near me (which prosecuted some poor slob for flying the American flag!) is a gated community with contiguous lot access to a shopping mall. People drive their golf carts to the grocery store and restaurants there, and never once travel on public roads. So it will be with Segway. Relatively affluent and increasingly arthritic retirees will buy the things in droves for their morning jaunt down to breakfast at The Good Egg. Down here the sun shines all the time, and my guess is that one small 2' X 4' PE panel will suffice to recharge the battery pack fully in an hour or two given exposure to full sun. Crowding is not an issue, and nobody has to go more than a mile and change to reach the mailboxes and shopping areas. I see no indication that Kamen has hit on this, but he will eventually. By contrast, hordes of screaming Segways on the streets of New York, Chicago, or (God help us) Amsterdam is a kind of nightmare vision. The real market is what I might call the "commerce-integrated suburb," where some degree of conscious planning has placed housing in reasonable proximity to stores, restaurants, and office suites. Surburban lack of density is what allows Segway to work. In superdense urban environments like New York City, it's hopeless. Really. Anyway. 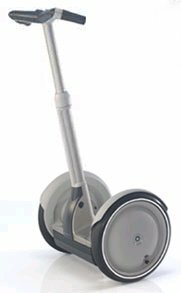 The product's real name is Segway HT ("Human Transport") and it's got a very nice Web site with pictures and an "interactive model" that is worth the 1.25 MB download, if you have a reasonably fast Net connection. Definitely an urban invention, and won't be used much out here in cactus country, but I'll bet they become popular in Seattle. Now, what's the deal on the six-wheeler that can (supposedly) climb stairs? That's something I would really like to see. Get on it, Dean. This will in fact catch most spam; my concern is whether it will ever in fact dump a "real" message. I did a test scan on my (immense) mail base and found several hits, all but one of which was "...to be taken off..." (The other was "...to remove yourself..." So I guess it's not that risky...unless, perhaps, you're engaging in an email discussion about spam. Hmmmm. I've had some reasonable luck just rejecting entire domains like chocolatepage.com and bidbuywin.com. A great deal of spam comes from relatively few domains, and it's clear from some of those domains that they are used exclusively for marketing, unlike excite.com and yahoo.com. I watch new spam and when I see a domain more than a time or two, I add it to the list. This has certainly helped...but something eventually has to be done about spam. I see again and again on lists and comments on Slashdot that 75%-80% of all email many people receive is spam. I'm there, certainly. Someday we have to address what a waste of bandwidth this is, and how we could do something about it.